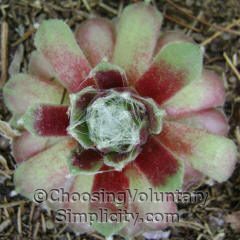 … in others the rosettes will almost be covered in fine white cobwebby threads. 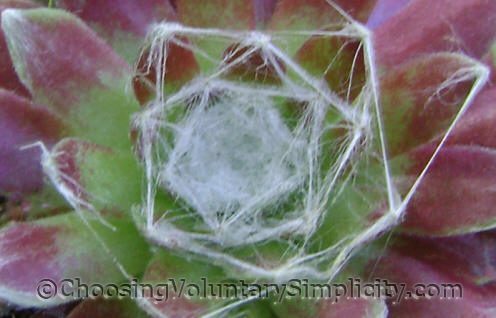 If they are happy with their growing conditions, cobweb houseleeks… like other sempervivums… will quickly produce chicks, and those chicks will grow and produce more chicks. 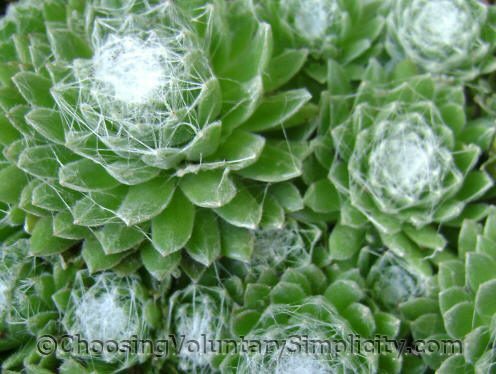 Before long a few plants will have spread to form a large mound of mature rosettes and chicks with the cobweb threads stretching not only from leaf to leaf but also from rosette to rosette. 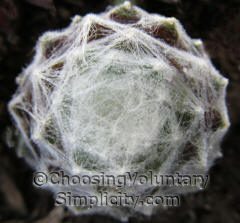 Eventually the white threads growing from the tips and sides of the leaves will form a network of cobwebs over the entire mound. I’m already scouting out some of these to grow here in the spring. I especially like the one little ball that is totally covered with the webs. You have my sincere gratitude about setting me straight on no spiders having to do with those webs. Spiders and I have a very edgy truce in my household. Those plants though, webs and all, are fantastic! They look so vibrant and lovely. I still remember when your poor sempervivums were at the mercy of those deer a while back, I’m so glad you have new ones that are thriving so well! Really really pretty! 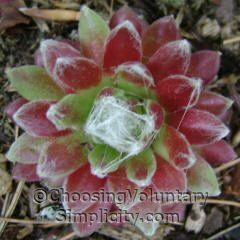 Until I read your blog I thought sempervivums were just plain like the ones my mother used to have. I never knew that there were so many colors or types or how beautiful they can be. I wish I could see all your plants and flowers all together up close. 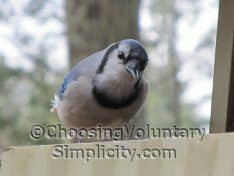 Your gardens must be absolutely beautiful. 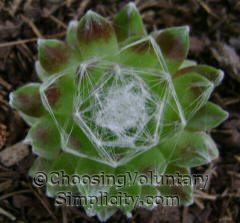 Just found your blog from searching for sempervivum arachnoideum and I can’t stop reading. This is such an amazing blog. I am loving all your stories and fine information. The variety here is incredible. Thank you for this wonderful site!!! !